Learn how to use the Model-View-ViewModel (MVVM) pattern in your iOS apps with ReactiveCocoa in this 2-part MVVM tutorial series. This is a light-hearted ‘jab’ at iOS developers, but I am sure you have all seen this problem in practice; the overweight and unmanageable view controller. This MVVM tutorial takes a look at a different pattern for structuring applications, Model-View-ViewModel, or MVVM. This pattern, facilitated by ReactiveCocoa, provides an excellent alternative to MVC, and guarantees sleek and lightweight view controllers! Note: This tutorial is written in Objective-C, not Swift. It also targets Xcode 5, not Xcode 6, and all screenshots are made with Xcode 5. For best results, use Xcode 5 when going through this tutorial. However, if you are interested in checking out the Swift version of this sample project, check out my recent blog post where I did just that! Before you start writing code, it’s time for a bit of theory! This tutorial is primarily about MVVM, and assumes you have a working knowledge of ReactiveCocoa. If you haven’t used ReactiveCocoa before, I strongly advise following my earlier tutorial series that will introduce you to the topic. If you’re in need of a quick refresher of ReactiveCocoa, I’ll briefly recap the salient points. At the very core of ReactiveCocoa are signals, represented by the RACSignal class. Signals emit a stream of events, which are all one of three types, next, completed and error. Using this simple model, ReactiveCocoa can serve as a replacement for the delegate pattern, target-action pattern, key-value observing, and more. The signal API creates code that is more homogenous, and hence easier to read, but the real power of ReactiveCocoa is the higher-level operations you can apply to these signals. These operations allow you to perform complex filtering, transformation and signal coordination in a highly concise fashion. The Model-View-ViewModel, or MVVM pattern as it’s commonly known, is a UI design pattern. It’s a member of a larger family of patterns collectively known as MV*, these include Model View Controller (MVC), Model View Presenter (MVP) and a number of others. Each of these patterns is concerned with separating UI logic from business logic in order to make applications easier to develop and test. Note: For a detailed look at design patterns in general, I recommend Eli’s or Ash Furrow’s articles. To understand the MVVM pattern better, it helps to look back at its origins. This pattern separates the UI into the Model that represents the application state, the View, which in turn is composed of UI controls, and a Controller that handles user interactions and updates the model accordingly. One of the big problems with the MVC pattern is that it’s quite confusing. The concepts look good, but often when people come to implement MVC, the seemingly circular relationships illustrated above result in the Model, View and Controller. In turn, they conflate into a big, horrible mess. More recently Martin Fowler introduced a variation of the MVC pattern termed the Presentation Model, which was adopted and popularized by Microsoft under the name MVVM. At the core of this pattern is the ViewModel, which is a special type of model that represents the UI state of the application. 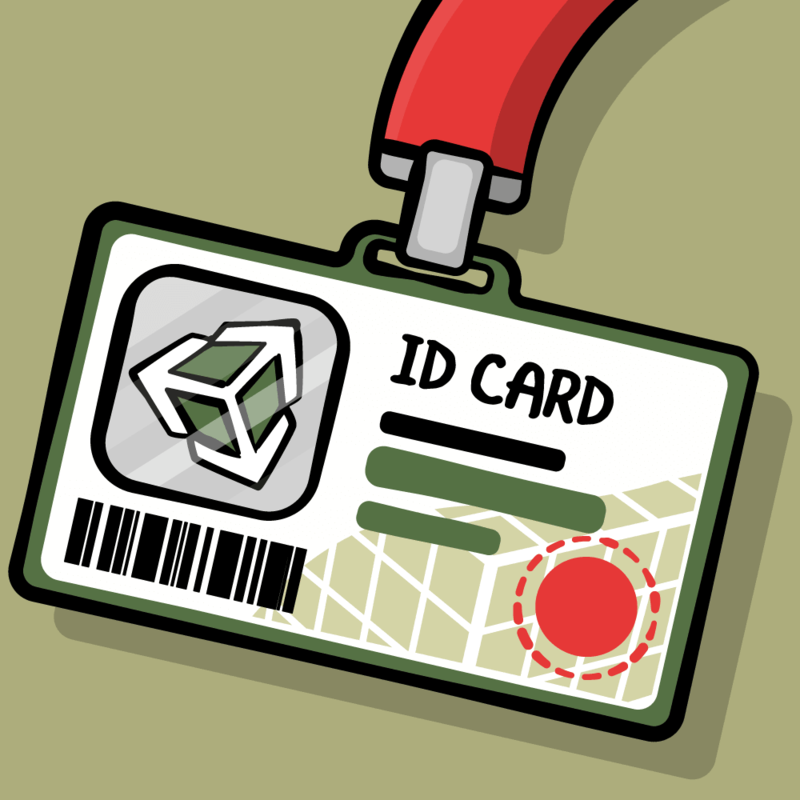 It contains properties that detail the state of each and every UI control. For example, the current text for a text field, or whether a specific button is enabled. It also exposes the actions the view can perform, like button taps or gestures. It can help to think of the ViewModel as the model-of-the-view. The View has a reference to the ViewModel, but not vice-versa. The ViewModel has a reference to the Model, but not vice-versa. If you break either of these rules, you’re doing MVVM wrong! Lightweight Views – All your UI logic resides within the ViewModel, resulting in a very lightweight view. Testing – you should be able to run your entire application without the View, greatly enhancing its testability. Note: Testing views is notoriously difficult because tests run as small, contained chunks of code. Usually, controllers add and configure views to the scene that rely on other application state. This means that meaning running small tests can become a fragile and cumbersome proposition. At this point, you might have spotted a problem. If the View has a reference to the ViewModel but not vice-versa, how does the ViewModel update the View? Ah-ha!!! This is where the secret-sauce of the MVVM pattern comes in. The MVVM pattern relies on data-binding, a framework level feature that automatically connects object properties to UI controls. The WPF framework ‘binds’ these two properties together. The TwoWay binding ensures that changes to the ViewModel’s Username property propagate to the Text property of the TextField, and vice-versa, i.e. user-input is reflected in the ViewModel. Unfortunately, iOS lacks a data-binding framework, but this is where ReactiveCocoa acts as the ‘glue’ that connects the ViewModel together. …with ReactiveCocoa binding the two together. Note: For a more detailed historical analysis of UI patterns I would highly recommend Martin Fowler’s GUI Architectures article. Have you had enough theory? Well, if not feel free to go back and read it again. Oh, you’re good? Okay, then it’s time to have a go at creating your own ViewModels. You’ll learn more about each dependency as it’s put to use. 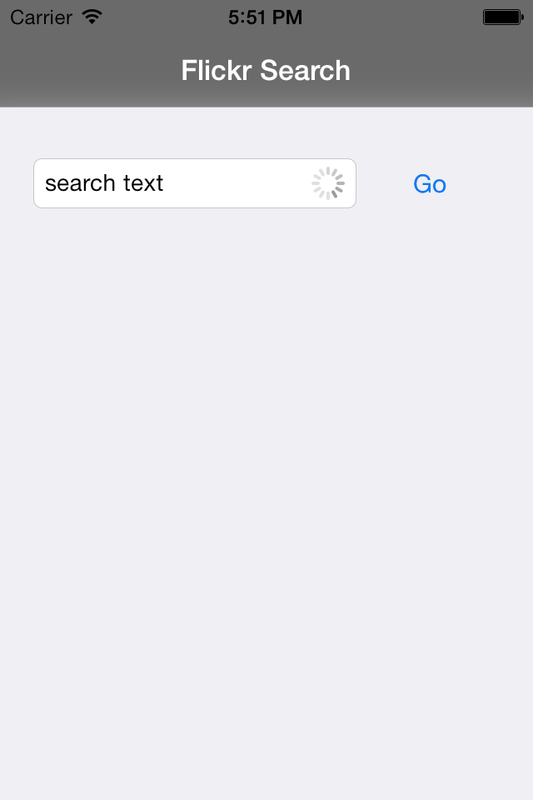 RWTFlickSearchViewController: The main screen of the application, which contains a search text field and the ‘Go’ button. RWTRecentSearchItemTableViewCell: A table cell that renders recent search results within the main screen. RWTSearchResultsViewController: The search results screen that shows a table of images from Flickr. RWTSearchResultsTableViewCell: A table cell that renders individual images from Flickr. Time to add your first view model! 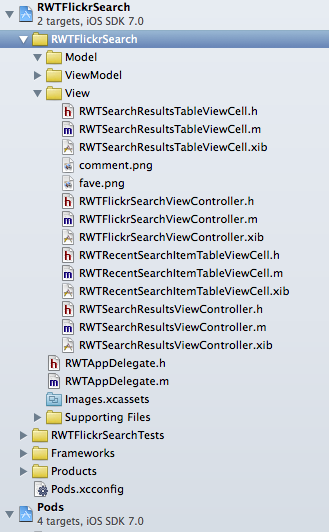 Add a new class to the ViewModel group, naming it RWTFlickrSearchViewModel and making it a subclass of NSObject. The searchText property represents the text displayed in the text field, and the title property represents the title displayed in the navigation bar. Note: In order to make it easier to understand the application structure, the Views and ViewModels share a common name with a different suffix. For example RWTFlickrSearch-ViewModel and RWTFlickrSearch-ViewController. This simply sets the initial state of this ViewModel. The next step is to connect the ViewModel to the View. Remember that the View holds a reference to the ViewModel. In this case, it makes sense to add an initializer that constructs the View, given the respective ViewModel. Note: We’re referring to our controllers as “Views” in this tutorial to be more semantic with the “View” in MVVM. This differs from the default naming that UIKit uses. Note: This is a weak reference; the View references the ViewModel, but doesn’t own it. The above code executes when the UI initializes and applies the ViewModel state to the View. The final step is to create an instance of the ViewModel, and then supply it the View. This creates a new instance of the ViewModel, and then it constructs and returns the View. This serves as the initial view for the application’s navigation controller. Build and run to see that the View now has some state! You might have noticed you haven’t used any ReactiveCocoa yet. In its present form, any text the user enters into the search text field will not reflect in the ViewModel. In this section, you’re going to use ReactiveCocoa to bind the ViewModel and View together in order to connect both the search text field and button to the ViewModel. You’re adding the rac_textSignal property to the UITextField class by using a category within ReactiveCocoa. It’s a signal that emits a next event containing the current text each time the text field updates. The RAC macro is a binding; the above code updates the searchText property of the viewModel with the contents of each next event emitted by the rac_textSignal. In short, it ensures that the searchText property always reflects the current UI state. If the above sounds like utter gibberish, you really need to re-visit the first two ReactiveCocoa tutorials! 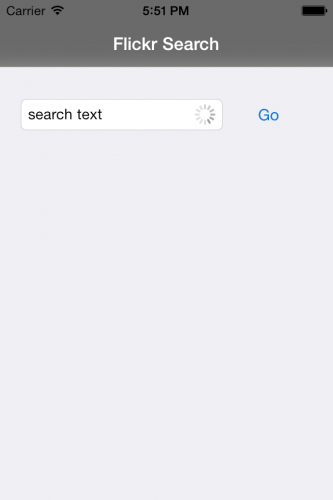 The search button should only be enabled if the text the user has entered is valid. We’ll keep things simple and enforce the rule that they must enter more than three characters before they can execute a search. The above code uses the RACObserve macro to create a signal from the ViewModel’s searchText property (this is a ReactiveCocoa wrapper over KVO). A map operation converts the text into a stream of true and false values. Finally, distinctUntilChanges is used to ensure this signal only emits values when the state changes. Note: If you’re having difficulty following, try breaking it down into smaller pieces. First add a RACObserve, logging the output, then add the map followed by the distinctUntilChanged operation as separate steps. What you have seen so far is that ReactiveCocoa is used to bind the View to the ViewModel, ensuring that the two remain synchronized. Furthermore, ReactiveCocoa is used internally within the ViewModel to observe its own state and perform other operations. This is a pattern you’ll see emerging throughout this MVVM tutorial. ReactiveCocoa is vital for binding the View and ViewModel together, but it’s also very useful within the other layers of your applications. In this section you’ll do something more useful with the validSearchSignal: use it to create a command that is bound to the View. RACCommand is a ReactiveCocoa concept that represents a UI action. It comprises a signal, which is the result of the UI action, and the current state, which indicates whether the action is currently being executed. This creates a command that is enabled when the validSearchSignal emits true. Within this method, you’ll perform some business logic as a result of the command executing, and will return the result asynchronously via the signal. For now, the above is merely a dummy implementation; the empty signal completes immediately. The delay operation adds a two-second delay to any next and completed events it receives. This is a very cunning way of making this code more realistic! Note: The above signal pipeline has a couple of additional logAll operations, and these are side effects that log all events that pass through them. While they are rather helpful for debugging ReactiveCocoa code, feel free to remove these logging operations if you don’t find them to be necessary. The rac_command property is a ReactiveCocoa addition to UIButton. The above code ensures that button taps result in the given command executing, and that the enabled state of the button reflects the enabled state of the command. You’ll see that the button is only enabled when there are more than three characters in the text field. Furthermore, when you tap the button it’s disabled for two seconds, and becomes re-enabled when the execution signal completes. The RACCommand takes care of updating the state of the search button, but it’s on you to handle the visibility of the activity indicator. RACCommand exposes an executing property, and that’s a signal that emits true and false events to indicate when the command starts and ends execution. You can use these to reflect the current command state elsewhere in your application. This binds the networkActivityIndicatorVisible property of UIApplication to the command’s executing signal. This ensures that whenever the command executes, the small network activity indicator in the status bar will show itself. When the command executes, the loading indicator should be hidden; this is the opposite of the property you just bound. Fortunately, ReactiveCocoa has this covered with a not operation that can invert signals. The above ensures that the keyboard hides whenever the command executes. The executionSignals property emits the signals that generate each time the command executes. This property is a signal of signals (as introduced in the previous tutorial). Whenever a new command execution signal is created and emitted, the keyboard is hidden. Build and run the application to see the above code in action. At this point you have a clearly identifiable View (RWTFlickrSearchViewController) and ViewModel (RWTFlickrSearchViewModel), but, ummm, where is the Model? The answer is simple: there isn’t one! The current app executes a command in response to the user tapping the search button, but the implementation does nothing ‘ of value. What needs to happen is for the ViewModel to search Flickr using the current searchText, and return a list of matching pictures. You could add this logic directly into the ViewModel, but trust me, you would regret it! If this was a view controller, I would be willing to bet you would do exactly that. The ViewModel exposes properties that represent the UI state, it also exposes commands — and often methods — that represent UI actions. It’s responsible for managing changes to the UI state based on user interactions. However, it’s not responsible for the actual business logic that executes because of these interactions. That is the job of the Model. In this next step, you’re going to add a Model layer to the application. There’s a fair bit of ‘scaffolding code’ required, so just work through and you’ll get to something more interesting shortly. This protocol defines the initial interface for the Model layer, and moves the responsibility of searching Flickr out of the ViewModel. Are you feeling like this might be dejavu? If so, that’s because this is the same ‘dummy’ implementation that was located within the ViewModel previously. This protocol defines a single method that allows the ViewModel to obtain a reference to an implementation of the RWTFlickrSearch protocol. This simply stores a reference to the services. Finally, update the executeSearchSignal method as follows. The above method now delegates to the model to perform the search. The final step is to connect the Model and ViewModel. This class simply creates an instance of RWTFlickrSearchImpl, the Model layer service for searching Flickr, and provides it to the ViewModel upon request. Build and run, and verify the application works in exactly the same way it did previously! No, this was not the most exciting change to make, but take a moment to look at the ‘shape’ of this new code. The Model layer exposes a ‘service’ that the ViewModel consumes. A protocol defines this service interface, providing loose coupling. The Model layer exposes services and is responsible for providing business logic for the application. In this case, it provides a service to search Flickr. The ViewModel layer represents the view-state of the application. It also responds to user interactions and ‘events’ that come from the Model layer, each of which are reflected by changes in view-state. The View layer is very thin and simply provides a visualisation of the ViewModel state and forwards user interactions. Note: In this application the Model layer exposes its services using ReactiveCocoa signals. This framework is useful for far more than just bindings! The first step is to create the model objects that represent the search results. This is a model object that represents a single photo returned by Flickr’s search APIs. This allows you to test the search implementation by logging the results before you move on to the required UI changes. This represents a collection of photos as returned by a Flickr search. It’s time to write the code that searches Flickr! 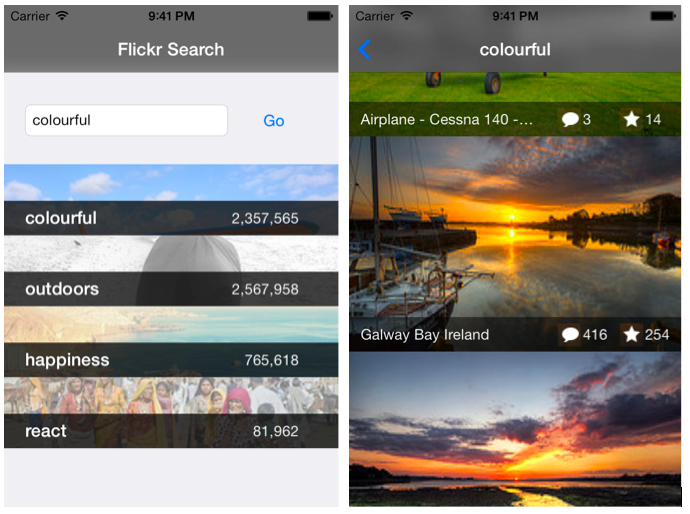 ObjectiveFlickr – this is an Objective-C API that wraps the Flickr API. It handles authentication and parses the API responses. It’s much easier to use this library than Flickr’s APIs directly. LinqToObjectiveC – this library provides a fluent and functional interface for querying, filtering and transforming arrays and dictionaries. This adopts the OFFlickrAPIRequestDelegate protocol, from the ObjectiveFlickr library and adds a couple of private properties. You’ll see how these are used very soon. This creates a Flickr ‘context’ to store the data ObjectiveFlickr requires to generate API requests. Note: To use ObjectiveFlickr you’ll need to create a Flickr App Key via the Flickr App Garden. It’s free and only takes a few steps. Be sure to request a non-commercial key. The ObjectiveFlickr API is pretty typical. You create API requests and the resulting success or failure is reported via delegate methods, as defined by the OFFlickrAPIRequestDelegate protocol mentioned earlier. The current API exposed by your Model-layer service class, as defined by the RWTFlickrSearch protocol, has a single method that searches for photos based on a text search string. However, in the near future you’re going to be adding further methods. Because of this, you’re going to dive straight in with a generic approach for adapting this delegate-based API to use signals. Hang on tight! This method takes an API request, as detailed by the method name and passed arguments, and then transforms the response using the given block argument. You’ll see how this works very soon. The createSignal method creates a new signal. The subscriber that passes to the signal block exposes methods that allow you to send next, error and completed events to the signals’ subscribers. An ObjectiveFlickr request is constructed, and a reference to this request is stored in the requests set. Without this code, the OFFlickrAPIRequest would not be retained! The rac_signalForSelector:fromProtocol: method creates a signal from the delegate method that indicates the completion of the Flickr API request. The signal is subscribed to, and the result transforms and gets sent as the result of the signal that is being created (more on this later). The ObjectiveFlickr API request is invoked. When the signal is disposed, this block ensures that the reference to the Flickr request is removed, avoiding memory leaks. rac_signalForSelector:fromProtocol: method creates the successSignal, and it also creates signals from delegate method invocations. A map operation extracts the second argument from the flickrAPIRequest:didCompleteWithResponse: delegate method, the NSDictionary response. The block that passes as an argument to this method transforms the result. You’ll shortly see how this converts from the dictionary to the model object representation. Finally, the transformed response is sent as a next event, and the signal completes. Note: There is a subtle issue with this code, think about what might happen if there are concurrent requests. You’ll fix that in the second part of this MVVM tutorial, but if you’re feeling adventurous, why not try to tackle it now? The above method uses the signalFromAPIMethod:arguments:transform: method that you added in the previous step. 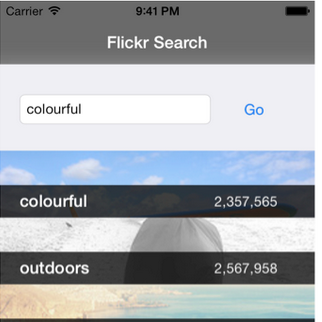 The flickr.photos.search API method searches for photos, with the search criteria supplied as a dictionary. The block passed to the transform argument simply converts the NSDictionary response into an equivalent model-object representation, making it easier to use within the ViewModel. This code makes use of the linq_select method that is added to NSArray via LinqToObjectiveC, providing a functional API for array transformation. Note: For more complex JSON-to-object mapping I’d recommend having a look at Mantle, although this particular model would require a Mantle 2.0 feature in order to map it correctly! Note: If you don’t get results, double check your Flickr API key and shared secret. If you recall from the earlier tutorials, I mentioned you have to use the block-based ReactiveCocoa API with some caution in order to avoid creating retain-cycles, which ultimately led to memory leaks. If a block uses ‘self’, and ‘self’ has a strong reference to the block a retain cycle forms. In the previous tutorial you saw how to use the @weakify and @strongify macros in order to break these retain cycles. Are you wondering why the implementation of the signalFromAPIMethod:arguments:transform: doesn’t use these macros when referencing self? It’s because the block serves as an argument to the createSignal: method, which doesn’t form a strong reference between self and the block. Confused? Well, you don’t have to take my word for it, just test the code to find those memory leaks. Run the application using the Product / Profile option, select the Allocations profile. When the application starts, use the filter in the top right corner to search for classes that contain the text ‘OFF’, i.e. those from the ObjectiveFlickr framework. And the good news is that the OFFlickrAPIRequest instance is de-allocated when the API request completes. Now you have conclusive proof that the block that initiates the Flickr request is not retained! I would encourage you to repeat this profiling process periodically to ensure that the heap only contains the objects you expect. Here is an example project with the code from this tutorial so far. This concludes the first part of this MVVM Tutorial with ReactiveCocoa! In the next part, you’ll look at how to initiate a view controller transition from the ViewModel and implement further Flickr API requests in order to make this application more feature rich. 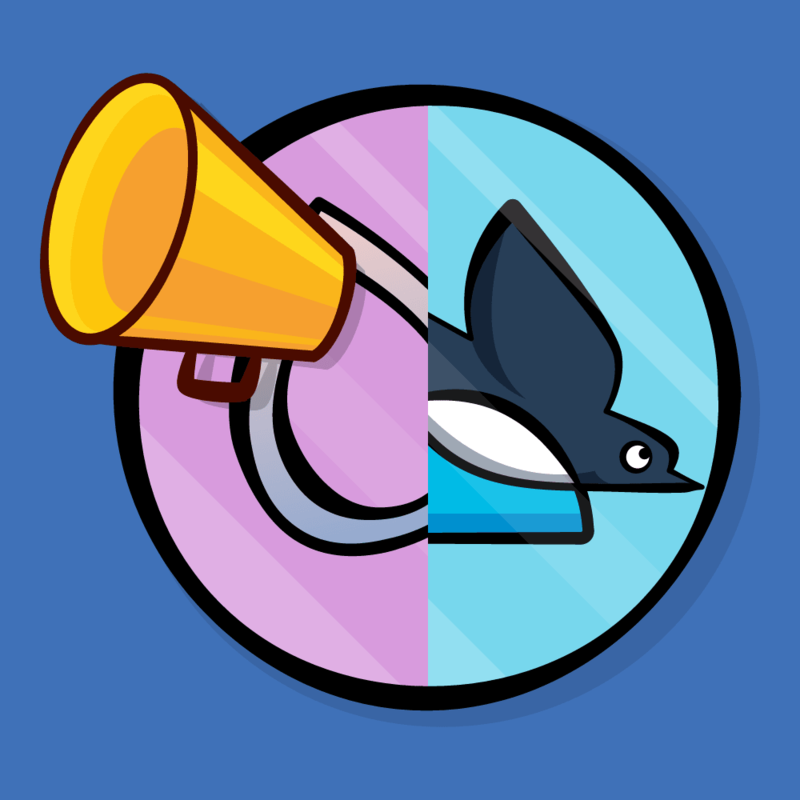 In the meantime, if you have any questions or comments please join the forum discussion below!